Shrimp Scampi is a classic Italian American dish that’s typically made with shrimp, a little butter, white wine, onions and garlic, and often served over pasta. 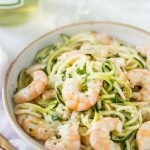 I’ve skipped the pasta for my Shrimp Scampi and opted for low carb zucchini noodles instead. Start by peeling the shrimp, but do not discard the shells! We’ll use them to make a simple shrimp broth that will add tons of flavor to the sauce. Then, add the shells to a pot of water, about two cups should be enough, and bring to a boil then simmer for about 20 minutes to make your shrimp broth. When it’s done you can drain it and discard the shells. Next, saute the onions and garlic for a couple minutes then add the wine, shrimp broth, and simmer for 10 minutes to reduce the liquid a little. 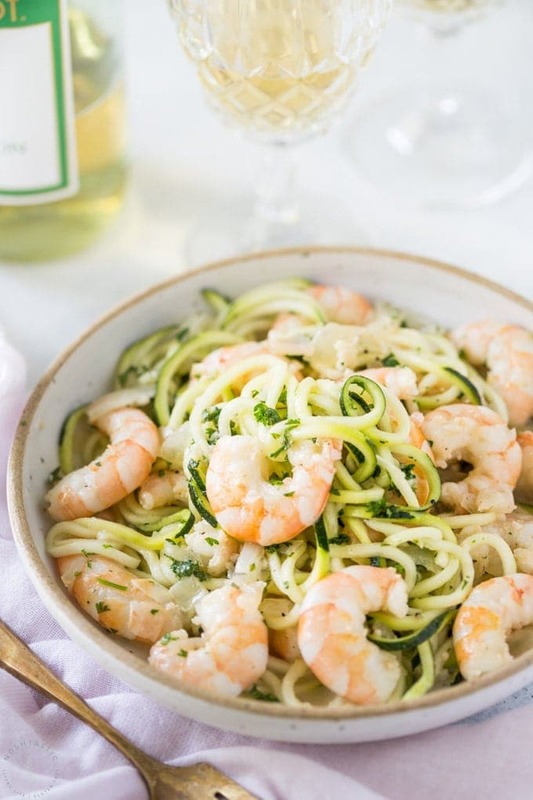 Lastly, add the peeled shrimp and cook for just a couple minutes turning the shrimp so it’s cooked on each side, then serve with lemon juice and chopped parsley over pasta or your preferred noodle, I used zucchini noodles. Is Shrimp Scampi an Italian Dish? 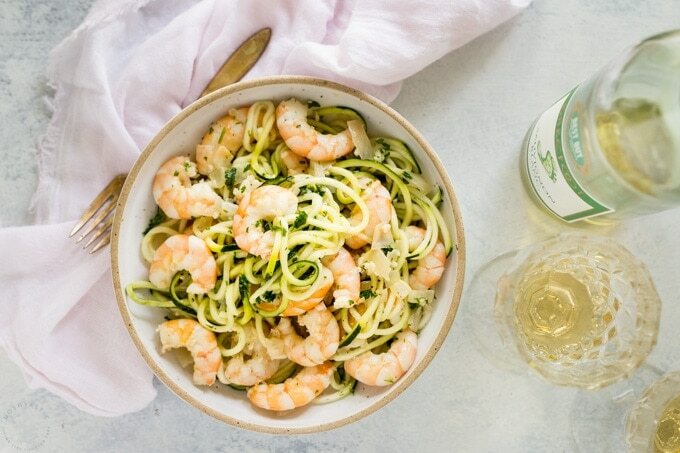 Shrimp scampi is made with shrimp due to it’s availability in the USA, and the sauce is a classic Italian white wine and garlic version. Scampi are actually small lobster like shellfish that would have been traditionally used to make this dish in Italy, they are also known as prawns in the UK and other countries. What is in a Shrimp Scampi Sauce? 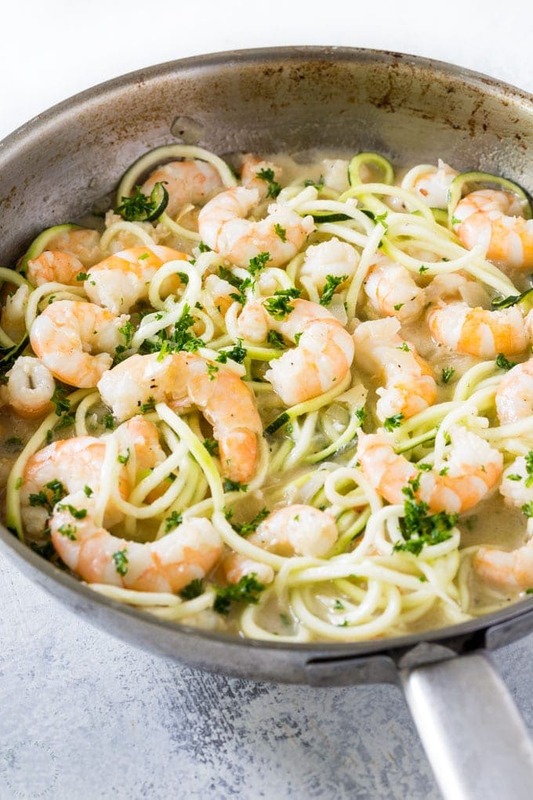 Shrimp Scampi sauce it usually a basic white wine and garlic sauce, and often has shallots or onions, garlic and a little parsley added. You can also make a version without alcohol by simply using a little more shrimp broth instead. 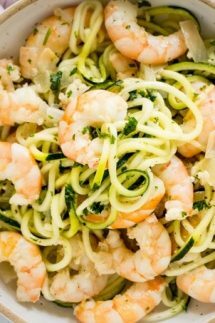 What Vegetable can I serve with Shrimp Scampi? 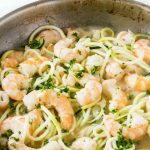 I served my shrimp scampi over zucchini noodles. If you are serving it over pasta then it would go very well with another green vegetable such as grilled asparagus, or a nice green salad with balsamic vinaigrette would be a great side dish too. Frozen shrimp can be thawed right before you need it, it usually takes less than 30 minutes. let the frozen shrimp sit in a large bowl of cold water for about 10 minutes, then drain and change out the water for a further 10 minutes and they should be completely defrosted. Alternatively you can let the shrimp thaw overnight in your fridge. Classic Shrimp Scampi recipe that you can whip up in no time at all! Peel the shrimp, keep the shells to one side. Add the shrimp shells to a pot with two cups of water, bring to a boil and then simmer for 20 minutes, then drain and discard the shells and keep the shrimp stock for later. Add the olive oil, butter, onion, and garlic and sauté for about two minutes in a large skillet. Add white wine, 1/2 cup shrimp stock (or more shrimp stock if you want to omit the wine) , salt, ground black pepper, and and simmer for 10 minutes. Add the shrimp and cook for 2 to 3 minutes or until they turn pink and no more, do not overcook! Add the chopped parsley and lemon juice and stir. Serve over cooked gluten free pasta or zucchini noodles. You’re so welcome, I hope you’ll try it!